It's been a couple of weeks since I posted an update, so I'll start with a report on last week's class. I sanded. For three hours. Without stopping. The end. And that's it for that post. It sounds mind numbing, I know, but I guess that's its charm. I can't say I'd want to do that all the time, but I admit there's something about going to class after a day at work and losing yourself in the most minute details. I've never spent much time meditating, but I have a feeling it has a lot in common with a three hour stint sanding the sides of a guitar (aside from the fact that meditating doesn't usually involve being covered with a film of rosewood dust). And the important thing is that the outcome was good. The purpose of all that sanding was to smooth and even the guitar's sides in preparation for routing the binding and purfling ledges. The binding is the strip of material that is applied around the edge of the top and back to bind them to the sides and they also serve a decorative function. And the purfling is a decorative feature that is applied next to the binding. While the binding is one strip of wood, the purfling is several strips (3 for the back and 5 for the top) of thin strips glued together. 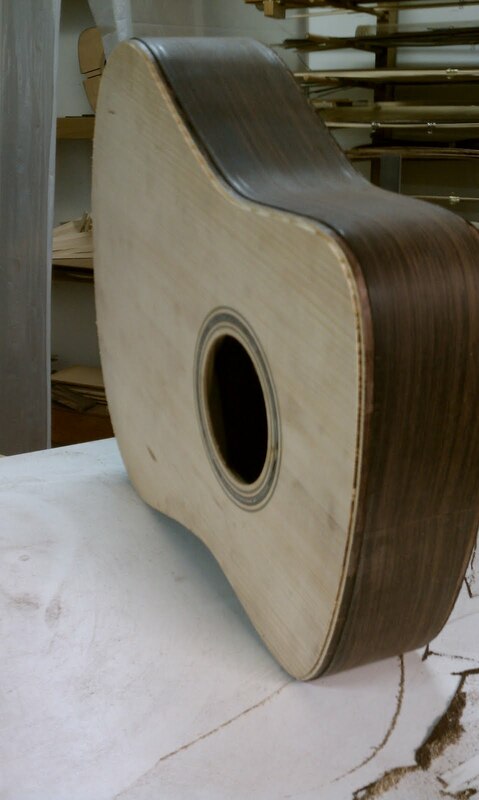 The multiple strips alternate in color so that if you were looking at the top you would see walnut binding on the outside edge of the guitar, then five thin strips alternating dark and light color inside that. So the job this week was to rout out the ledges for the binding and purfling to sit in. Since the binding is wider, it's necessary to rout once around the top and back for that ledge, then another narrower ledge on top of that for the purfling. And let me just say this: taking a power tool and cutting big chunks of wood out of something you've spent the last seven months working on is NOT meditative in any way. I can think of a very specific way to describe the feeling but since my dear mother may read this post, suffice it to say that it's not for the faint of heart, especially for someone who can count the number of times they've used a router in their life. But the job is complete, my guitar is intact, and I'm now ready to begin work on the binding and purfling. I'll start work on that task next week. And the final achievement this week was to rout the end graft. I wish I had remembered to take a picture because it was very satisfying and looks very nice. It would also really help in explaining exactly what it is. I'll try anyway. The end graft is a strip of wood at the very bottom of the guitar (where the strap button will go) that covers the intersection of the two sides. Like the binding, it has both a functional and a decorative purpose. 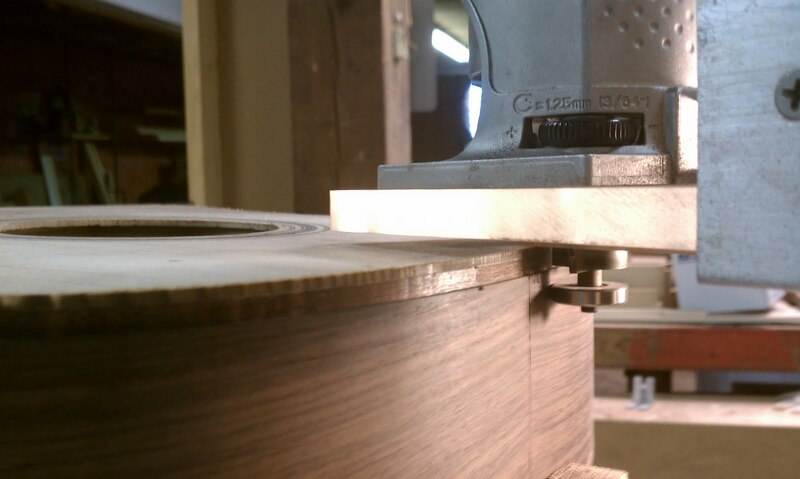 Now that it's been routed, a strip of walnut about 1/2" wide will be inserted. It won't be long before I'll be working on the neck. This thing might wind up with strings after all! Wonder of wonders.